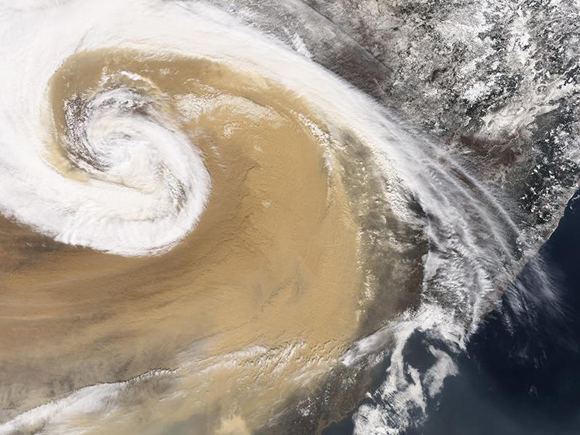 Even from far above the Earth, a satellite view shows the mass of dust blowing from East Asia over China. Desert dust can travel hundreds of miles in the atmosphere, affecting environmental conditions, health and climate states around the world. Photo courtesy of NASA. Enlarge Image. Results: Putting a climate model through some dusty drills, scientists at Pacific Northwest National Laboratory found how well it depicts the climate effects of particle size. Comparing three techniques to represent the particles' size distribution, they found a large difference among them—by a factor of 10—in the amount of cooling that dust provides at the top of the atmosphere. They also found large differences in the impact of dust size on the surface cooling and atmospheric warming. Their study, published in Atmospheric Chemistry and Physics, drives further examination of how desert-born particles impact climate, air quality and the ecosystem. Why It Matters: Rising and blowing from world deserts, dust can travel hundreds of miles affecting health, the environment and the climate of distant regions. Deserts cover about one-third of the Earth's surface and in some parts of the world, a dust storm can block sunlight for days, showing its ability to mask, reflect and scatter sunlight. But even when these effects aren't apparent to the eye, plumes of desert dust are working their far-reaching effects high in the atmosphere. Desert dust is considered a major contributor to the total atmospheric particle burden, and thus, plays a major role in regional and global climate systems and air quality. 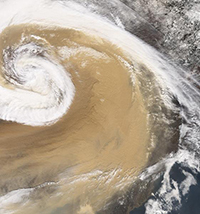 The PNNL research is part of a stepped approach to ascertain how dust is accounted for in a climate model, and then quantify how dust, often transported over long distances, impacts regional and global climate. Methods: Using the Weather Research and Forecasting-Chemistry (WRF-Chem) model, a meteorological and chemistry model, the PNNL-led team conducted quasi-global simulations with three different approaches to represent dust size: 8 discrete bins (8-bin), 4 discrete bins (4-bin), and 3 log-normal mode (3-mode). They identified and quantified biases in the 3-mode and 4-bin approaches compared to the more accurate 8-bin approach in simulating the dust mass balance and radiative forcing. Their results quantified the different approaches' abilities to represent the dust lifetime, dust mass loading, dry and wet deposition fluxes and dust number concentrations. They found that the aerosol optical depth among the three size approaches is much larger than their difference in dust mass loading. On a quasi-global average, the three approaches show a significant difference in dust surface cooling and atmospheric warming, with a large difference, by a factor of ~10, in the dust cooling at the top of the atmosphere. What's Next? This study shows the impact of dust's size representation in models on climate and environmental effects over remote regions. In new studies, scientists are developing a size representation that is closer to observations to understand the impact of dust transported over long distances, such as Saharan or Asian dust. Their studies will look at the impact of long-range transported dust on U.S. western region air quality and the regional water cycle. Sponsors: This research was supported by the U.S. Department of Energy's (DOE's) Office of Science, Biological and Environmental Research program as part of the Regional & Global Climate Modeling (RGCM) program and the National Science Foundation. This study used computing resources from the National Energy Research Scientific Computing Center, which is supported by the DOE Office of Science. Research Team: Chun Zhao, Siyu Chen, L. Ruby Leung, Yun Qian and Rahul Zaveri, PNNL; Jasper Kok, University of California Los Angeles; Jianping Huang, Lanzhou University, China.